Will New Zealand (and the U.S.) Finally Follow Australia on Gun Laws? Peters is with the International Action Network on Small Arms. She helped lead the campaign to reform Australia’s gun laws in the 1990s. 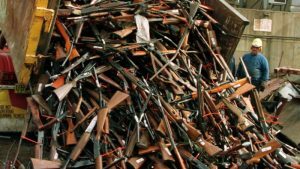 She just wrote the piece “‘It didn’t have to be this way’: how the gun lobby made NZ less safe” for the Sydney Morning Herald. “It didn’t have to be that way. Australia’s comprehensive overhaul of firearm policy after Port Arthur should also have been applied in New Zealand. Under our National Firearms Agreement, we banned semi-auto rifles and shotguns, removed 640,000 of these weapons from circulation with a buyback, required registration of all guns and dramatically raised the standard of screening for a gun license, including the obligation to prove a legitimate reason. This scheme was developed under the auspices of the Australasian Police Ministers Council — Australasian as in Australia plus New Zealand. Our two countries routinely collaborate on matters of criminal investigation and prevention, so it made sense for the solution to be Australasian. “Under pressure from the local gun lobby, New Zealand declined to join the scheme and instead held a review of its law. Unsurprisingly, the review recommended major changes along the lines of the Australian reforms, but those recommendations were ignored and never implemented. This left New Zealand out of step, not only with Australia, but with most other industrialised countries which recognise the need for robust controls over a product designed specifically for the purpose of causing death and injury. Peters’ past pieces include “When will the U.S. learn from Australia? Stricter gun control laws save lives” published in 2013 by the British Guardian.